This sky map shows the locations of the moon, Mars and the bright star Regulus as they will appear at 5 am local time to observers at mid-northern latitudes. 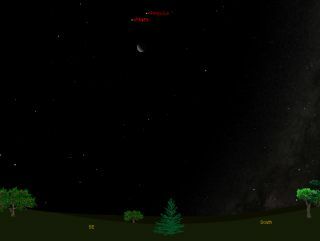 If you’re up after midnight early on Saturday morning (Nov. 19), you should be able to see a celestial gathering of a bright star, a bright planet and a rather wide waning crescent moon. If you check out the east-northeast sky at around 1 a.m. local time, you will find a triangle in the sky composed of the three cosmic bodies. The star is Regulus, the brightest star in the constellation of Leo, the Lion. This constellation has been of some interest these past few days because of the peak of the annual Leonid meteor shower on Nov. 17. The sky map of the three objects here shows how they will appear together before dawn on Saturday. The planet in the triangle is Mars, which comes up over the east-northeast horizon shortly before midnight. Both Mars and Regulus engaged in an eye-catching conjunction this past Monday (Nov. 14), which is what astronomers call a close approach of two celestial bodies. The moon, as noted, is now a crescent phase, having just passed its last quarter phase earlier this week. Once the trio climbs high into the eastern sky in the predawn hours on Saturday, you’ll see that they’ll seem to resemble an isosceles triangle, which has at least two equal sides. The triangle will appear tilted to the left, with the moon positioned at the vertex of the triangle. The star Regulus will mark the upper right corner, while Mars, which will glow noticeably brighter than Regulus and has a distinct orange-yellow color, will be at the upper left corner. Mars is finally brightening a little, and will continue to become slightly brighter by the end of the month. The Red Planet is still quite a bit away from Earth, at a distance of 133 million miles (214 million kilometers). But, Earth will continue to approach the planet through the balance of the fall and into the winter, and it will soon begin to brighten at a more rapid pace. To get a sharp telescopic view of Mars it will be best to go out at dawn to observe the planet high in the southeast or south-southeast sky. But, you will probably be disappointed, because the planet’s disk still appears extremely small; in fact, less than 7 arc-seconds wide. To get an idea of how tiny this is, you would need a telescope magnifying at 260-power to make Mars appear in the eyepiece the same angular size as the Moon does with your unaided eye.